Thirty American artists from throughout the U.S. just returned from a field trip to San Carlos, Sonora, Mexico, where they were working to produce a body of work for a museum exhibition entitled The Sea of Cortez, scheduled to premiere at The Arizona-Sonora Desert Museum Art Institute from March 16 through June 2, 2013. The Sea of Cortez exhibition will focus on the flora and fauna that inhabit the environments around San Carlos, Mexico, including the sea’s incredible marine life, the region’s desert topography, the Estero el Soldado mangroves (one of the most pristine lagoons left in the Gulf), Nacapule Canyon, and scenic overlooks such as Mirador with sweeping vistas, sheer cliffs and the sea below. The Sea of Cortez exhibition will include plein air paintings, botanical illustrations, sketch books with journal entries, wildlife paintings and sculptures, photographs, and other media. Serving as Curator for the exhibition is David J. Wagner, Ph.D., who also serves as Curator/Tour Director for Art and the Animal of The Society of Animal Artists, and Blossom ~ Art of Flowers sponsored by The Susan Kathleen Black Foundation. The Sea of Cortez field trip was organized by David J. Wagner, L.L.C. Leading the field trip was Richard C. Brusca, Ph.D., who serves as a member of the Science Faculty at the University of Arizona. Recently retired from the Arizona-Sonora Desert Museum where he directed the ASDM Press and served as ASDM Senior Director of Conservation & Science, Dr. Brusca is widely recognized as a leading authority on Sea of Cortez studies. Field Trip transportation was made possible by The Susan Kathleen Black Foundation and Glenn and Martha Thompson. The Sea of Cortez is available for display in 2013 and 2014 at museums nationwide. The exhibition is being produced by David J. Wagner, L.L.C. For further information contact call (414) 221-6878 or email davidjwagnerllc@yahoo.com. 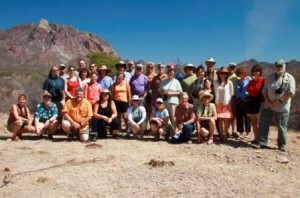 Field Trip to San Carlos, Sonora, Mexico, March 19 – 26, 2011. Pictured are Linda Bittner, Carel Pieter Brest van Kempen, DeVere Burt, Andrew Denman, Kim Diment, Kim Duffek, Cathy Ferrell, Susan Fisher, Susan Fox, Mary Garrish, Ann Geise, Shawn Gould, Mary Helsaple, Heiner Hertling, John Kobald, Deian Moore, John Pitcher, Don Rambadt, Paul Rhymer, Rebecca Richman, Carolyn Thome, Christine Sarazin, Rachelle Siegrist, Wes Siegrist, Martha Thompson, Glenn Thompson, Sue Westin, Ronnie Williford, Debbe Wilson, and Nicholas Wilson. (Not pictured are John Agnew and Molly Moore). Leading the field trip was Richard C. Brusca, Ph.D. The trip was organized by David J. Wagner, Ph.D. for artists to produce a body of artwork for a museum exhibition entitled The Sea of Cortez, produced by David J. Wagner, L.L.C., and scheduled to premiere at The Arizona-Sonora Desert Museum Art Institute from March 16 through June 2, 2013.